Travel theme: Twist | Oh, the Places We See . . .
We knew something was wrong when the captain of Delta Flight 380 from Knoxville to Atlanta said a mechanic was on his way. A mechanical problem, he said matter-of-factly, and then he turned our plane (already on the runway) back to the terminal. We deplaned. We lined up. We stood at Gate 5 for rescheduling to begin. When a twist I’ve never seen occurred. 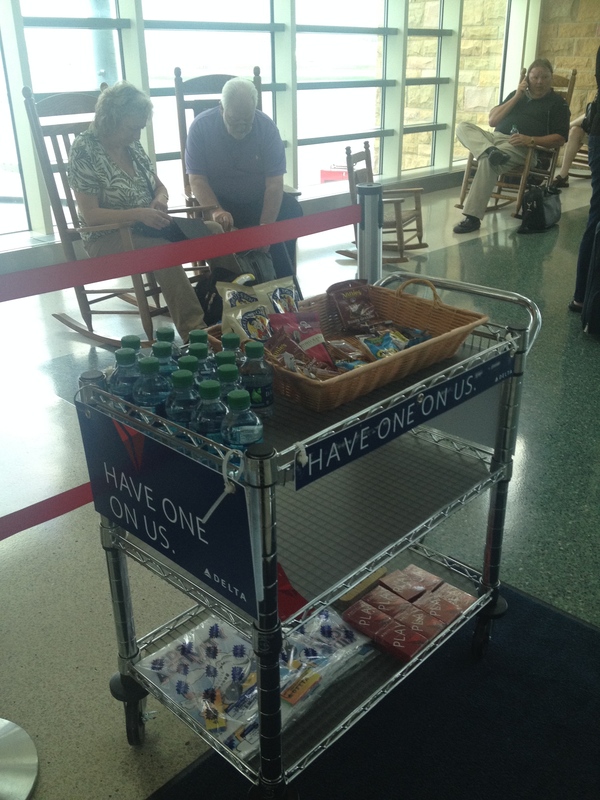 In McGhee Tyson Airport, a would-be passenger helps himself to Delta’s free treats. 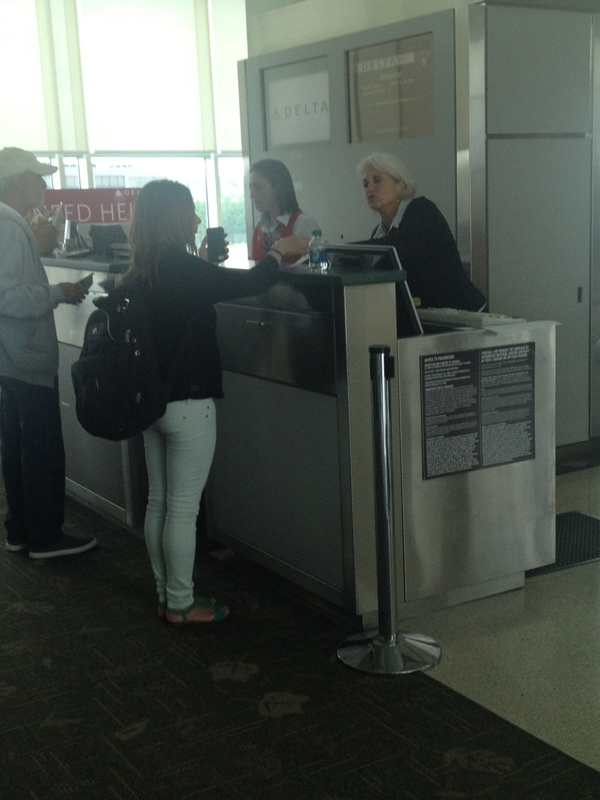 Luckily, most of us received new boarding passes for later flights from patient attendants and scheduling gurus. No pushing, whining, or crying. We just took our new assignments and then turned to the cart. Waiting for a later departure with a snack from Delta! It’s just another travel twist, I guess. But I was oh, so grateful for a pack of Trail Mix and a bottle of Dasani. And a chance to arrive at my final destination before supper time. For more entries into Ailsa’s Travel theme: Twist, click here. This entry was posted in Travel, Travel Theme and tagged Delta Airlines, McGhee Tyson Airport, rescheduling, twist. Bookmark the permalink. That’s definitely a nice twist! And you know I think it does pay to look after customers like that – in staff turnover alone. Imagine how much more pleasant it must have been to be able to offer some trail mix and not get yelled at! 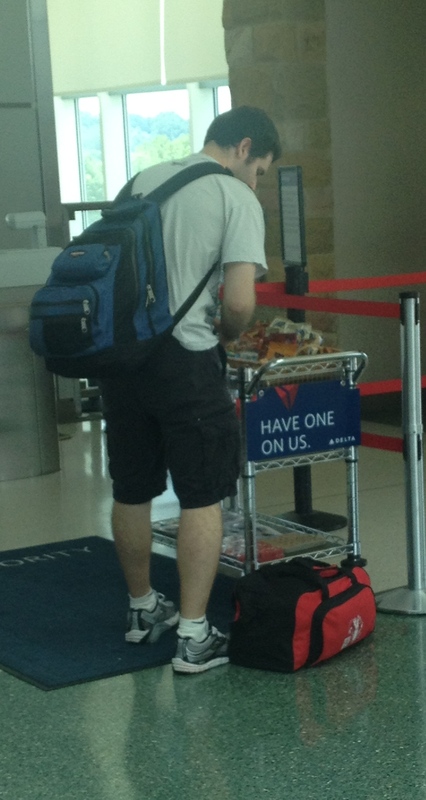 It may not seem like much to some people, but to us frequent travelers, stuff like this just doesn’t happen often! I agree — it was very nice not to be yelled at!!!! Thanks for the comment! This is a very happy twist indeed. I love to travel but sometimes patience is required. this gesture on the part of an airline can make a big difference. And thank goodness they make those nice gestures every now and then. Traveling can be pretty tough! Thanks for reading. You’re right! I couldn’t believe it when I saw this lady pushing the cart out. Then she passed out cards with phone numbers so we could begin the process quickly of changing our schedules. Good for Delta, right? I have some horror stories, too, but this was one twist in my favor!!! And to top it all, I was upgraded to 1st class on the last leg of my trip. Woot! Woot! With all the negative press the airlines seem to get, this certainly was a nice surprise. It was a very nice surprise. And I’m really glad we didn’t fly out on a plane that needed repairs. Fortunately, I didn’t have to be somewhere at a certain time today. Thanks for reading!